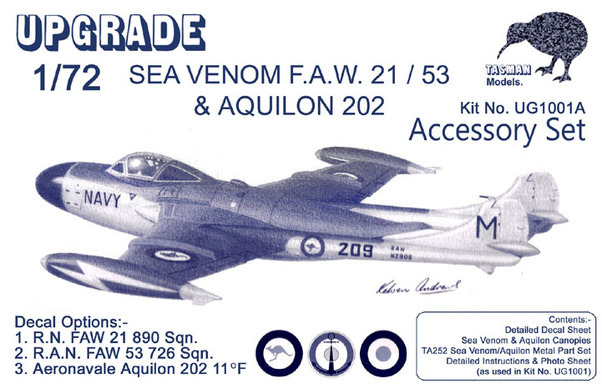 This re-release of the UPGRADE UG1001A accessory set for the Sea Venom & Aquilon 202 combines four products in one. It includes decal sheet TD7212 which features three decal options, Royal Navy, Royal Australian Navy and French Navy. Two sets of canopies, TA220 Sea Venom and TA253 Aquilon 202. Another new product is also included, TA252 Sea Venom/Aquilon 202 Cockpit Accessory Set comprising six white metal detail parts, two ejection seats, two instrument panels, control column and control panel. Also included is an extensive set of kit instructions, photo sheet and line drawings that were originally produced for the Upgrade kit UG1001.